The Carriers include (front) David Kelly, (middle) Kristi Hadfield, Jan Kelly, and (back) Denver Adams. 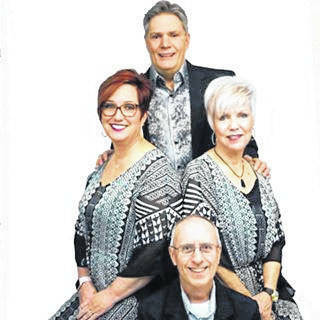 TUPPERS PLAINS — The Carriers will be singing at the Amazing Grace Community Church in Tuppers Plains, Ohio (across from the Tuppers Plains Fire Department) this Sunday morning, June 24 at 10 a.m. A luncheon will follow. Poised with the task of sharing the Gospel through the ministry of song, The Carriers were formed in 1969. During much of the 1970’s and 80’s the group traveled the east coast, playing hundreds of engagements each year from Maine to Florida. Six decades later, the realization of The Carriers’ ambition continues. Although the group has gone through a number of changes, their message has remained the same: sharing the good news through the universal medium of music. The group is a joy to listen to, exciting to watch, entertaining, yet serious about the message of Christ. David jokingly claims the group was formed “because we wanted to sing, and no one else would sing with us.” There’s been no shortage of great talent on the stage over the years. David’s talent is undeniable. Hitting the low notes with the greatest of ease, he can hold his own among the best bass singers in gospel music today. He has also written many of the songs the group sings. David is joined on stage by Denver Adams, Kristi Hadfield, and Jan Kelly. Denver has been a lifelong member of the group. When it comes to singing baritone, he is one of the best in the business, demonstrating not only a smooth solo voice, but blending expertly with the other members of the quartet in impeccable harmony. Kristi is the newest member of the group. She was originally with The Carriers in 1933-1934. She has an amazing voice, a contagious smile and a no nonsense passion for serving the Lord. The Carriers are blessed to have her return and eager for our audience to get to know her. David’s wife, Jan, rounds out the quartet, as she lends her rich alto voice to the blend. An accomplished and talented vocalist, the warmth of her voice, her stage presence, and her personality endear her to audiences everywhere, as she communicates the message of Christ in a loving and sincere way. https://www.mydailysentinel.com/wp-content/uploads/sites/14/2018/06/web1_6.20-Carriers_ne2018619141528964.jpgThe Carriers include (front) David Kelly, (middle) Kristi Hadfield, Jan Kelly, and (back) Denver Adams.